Great home-cooked food and entertainment nightly! Come to Momma’s for all your favorite comfort foods (ribs, steaks, fried chicken, mac n’ cheese), and lots of healthy eats too (seared ahi tuna, hummus n’ veggies, big salads, grilled chicken sammys). MLT also has 2 full bars, live music every Friday and Saturday night, daily happy hour, weekly trivia, and so much more. Local’s Tip: Try one of Motherloaded’s Housemade Infusions…over 20 varieties to taste like Honey Habanero Bourbon, Strawberry Agave Vodka, and Peach Tequila. Also $2 off during daily happy hour! The Motherloaded Tavern - All The Best Punk Rock and Roll From Colorado to tickle your ear holes. 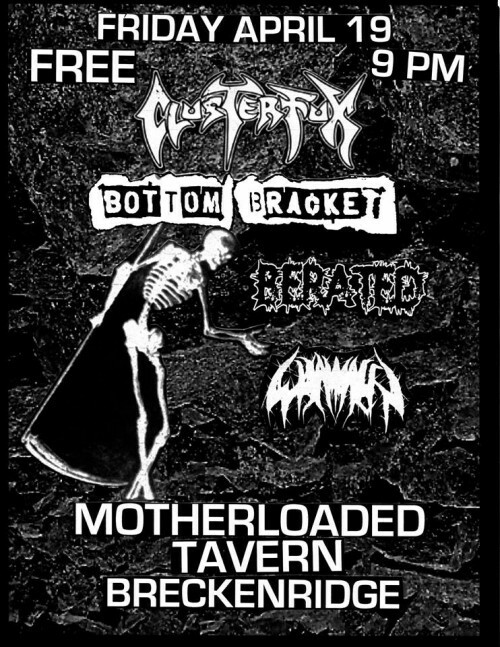 Performances by Clusterfux, Bottom Bracket, Berated and Whammer. *Tip - Motherloaded Tavern offers a great happy hour every day from 3-6pm and hosts trivia, open mic nights and live music every week!